Its sharp-eyed examination of latent racial tensions and gentrification in the suburbs of Chicago saw Bruce Norris’s play Clybourne Park pick up three of the biggest awards in world theatre, including the Pulitzer prize. So it’s hardly surprising that the American playwright intervened to prevent a production in Germany that was set to employ a white actor in blackface. After learning of the Berlin-based Deutsches Theater’s plans to cast a white actor to play a black character in the play last year, Norris withdrew the performance rights, putting a stop to the production. Blacking up remains a relatively common practice in German theatre and is often justified on the basis of directorial prerogative, since play texts are treated with less reverence than in British theatre. Last year, the Deutsches Theater’s production of Othello cast a white woman in a gorilla suit in the lead role to explore the play’s concern with race. A petition was started in Germany last weekend in response to a recent production of Herb Gardner’s I’m Not a Rappaport at the Schlosspark Theater in Berlin, in which a white actor painted his face black to play an elderly African-American character. Director Thomas Schendel defended the casting on the basis that the company had been unable to find a black actor suited to the role. He added that “blackface is a part of the theatre tradition” in Germany. However, Norris took exception in the case of Clybourne Park. 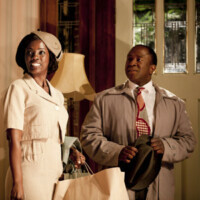 Set in the same fictional Chicago suburb inhabited by Lorraine Hansbury’s 1959 play A Raisin in the Sun, the satire tracks the changing fortunes of the area — first in the 1950s, when a black family moves into the predominantly white neighbourhood, then in 2009, when the roles are reversed. Sonja Anders, the dramatic adviser at the Deutsches Theater who corresponded with Norris, said she and the playwright had decided to drop the play over irreconcilable differences as to how it should be cast. “We decided we couldn’t go ahead with the play because we had a very different ideas,” she told the Guardian. “We got hold of the play and had decided we wanted to do it as a play that threw interesting light on the theme of the role of foreigners, what it means to be different, how foreigners perceived themselves and how they are perceived. We thought this had a very interesting relevance for Germany and wanted to set the play in Germany and therefore in the German context. The play’s British premiere, which took place at the Roual Court in 2010 before transferring to the West End, won Norris the Olivier Award for Best New Play. The Guardian‘s theatre critic Michael Billington wrote that it “nails the thorny subject of race with a bilious zest that takes one’s breath away.” a Tony Award-winning production ended its run on Broadway in September. Meanwhile, in another – if less controversial – instance of artistic protection, representatives of Arthur Miller’s estate have ordered an Australian production of Death of a Salesman to reinstate the play’s proper ending. During its first run, which sold out the Sydney theatre earlier this year, Simon Stone’s staging changed the manner of Willy Loman’s death from intentionally crashing his car to suicide by gassing. However, the original final scene will be restored when the production returns next week. The Belvoir’s general manager Brenna Hobson put the change down to “miscommunication” when rights were being negotiated.